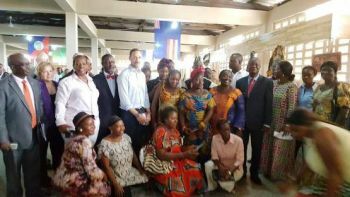 April 2-5, 2017….UNDP in partnership with the Ministry of Commerce and Industry held a program on April 3rd as part of the official visit of His Royal Highness Crown Prince Haakon of Norway at the Liberian Market Place at the Jorkpen Town Nancy B. Doe Market in Sinkor on 8th Street. 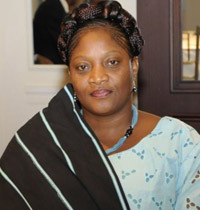 The Liberian Market Place is an initiative of the Ministry of Commerce and Industry and provides a platform for Micro, Small and Medium Enterprises (MSMEs) and Liberian entrepreneurs to showcase their produce and innovations. The program afforded His Royal Highness Crown Prince Haakon the opportunity to listen to small business owners and see the amazing the work they are doing to transform their lives. In remarks, Hon. 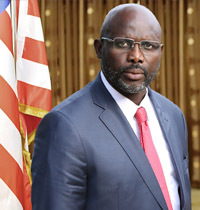 Axel M. Addy welcomed the Crown Prince to the Liberian Market Place and thanked him for the visit while Deputy Minister for Small Business Administration, Hon. 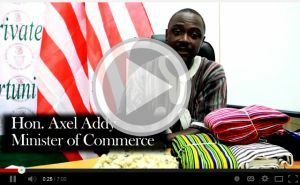 Andrew G. Paygar gave a brief history of the Liberian Market Place. Following that the Crown Prince was taken on a short tour of the facility. Speaking briefly, the Crown Prince told the small business owners that as UNDP Goodwill Ambassador, he is an advocate for UNDP’s effort to alleviate poverty which is the number one goal of the UNDP’s Sustainable Development Goals (SDGs). He thanked them for their contribution to society.